Many people turn to online fundraising to help them offset the cost of brain cancer treatment. Iram Leon is battling with this disease, and his doctors have told him that he probably will not live to see his 40th birthday. The Sports Society for American Health has turned to DonationTo.com to help them raise money online to create a scholarship for Leon’s daughter. Even though Leon has brain cancer, he has made a commitment to meeting his personal goals while he still can. 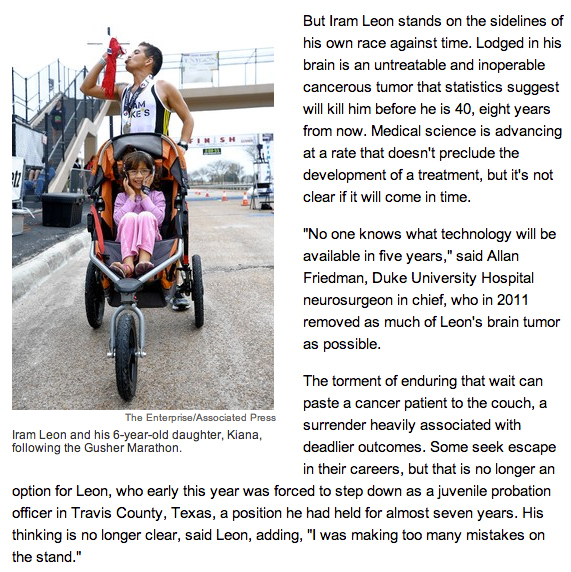 On March 9, 2013, Leon crossed the finish line of the Exygon and Baptist Hospitals Gusher Marathon in first place, and he was pushing his daughter in a stroller the entire time. This inspirational story has encouraged more than 100 people to donate online to the ram Leon – Rush the Gush Fund. The host of Leon’s fundraiser was able to avoid paying any credit card fees by using DonationTo.com to raise money online. Additionally, DonationTo.com enables people to bring their fundraising ideas to life without losing a percentage of each donation. For example, if the online fundraising campaign for Iram Leon was hosted elsewhere, they could have already lost more than $600 of the money that they have raised to fees. When it comes to a medical fundraiser, it is imperative to be able to keep every cent that is raised, and this makes DonationTo.com the ideal solution. Even if you feel like you need to learn how to fundraise, you can still easily use the DonationTo.com format. In fact, the website has been designed to enable first-timers to launch their fundraising ideas quickly without any technical skills. You will also gain access to a highly useful social networking integration tool that will make it easier to encourage people to donate online. The Wall Street Journal published a story on March 21, 2013, about Leon’s amazing accomplishment. According to the article, Leon’s doctors have removed as much of the tumor as they can, but they are now out of options. Therefore, unless there is a medical breakthrough within the next eight years, Leon is expected to die from his condition. The National Cancer Institute has been encouraging cancer patients to exercise for a long time, and their research indicates that it can have positive benefits. Even though the exercise is not going to beat Leon’s brain cancer, it could extend his life, and there is always the possibility that new surgical methods will be discovered that could change his prognosis. Leon has been running since late 2010. At that time, his neurosurgeon advised against it, but instead of resigning himself to a life spent on the couch, Leon looked for a new neurosurgeon who would support his desire to run. Allan Friedman, the neurosurgeon in chief at Duke University Hospital, provided Leon with the support that he wanted. Friedman has even scheduled Leon’s treatments around his marathon schedule, and he believes that running is helping his patient. In 2011, Friedman performed an operation to remove as much of Leon’s tumor as possible, and he continues to monitor the rest of the tumor for any new growth or changes. Even though Friedman is supportive of Leon’s decision to run in marathons, it is still imperative for him to always go on practice runs with a partner. Some of the medication that Leon takes can cause him to vomit while he is running, and he also woke up once in an ambulance after blacking out. When Leon first started running, he signed up for a wide variety of races. However, he is now only interested in participating in marathons that will allow him to run while he is pushing his daughter in a stroller. According to Leon, he has undertaken this unusual step to ensure that his daughter will have positive memories of him that do not involve him being sick. Even with the added physical stress of pushing a stroller, Leon was able to win a marathon by crossing the finish line at the 3:07:35 mark. Leon’s personal best is 3:07:34, but he hit that mark in a race he ran in 2011 without his daughter. More than 35,000 Americans are diagnosed with one of the two types of brain cancer each year. A primary brain tumor originates in the brain, and a metastatic brain tumor will start somewhere else in the body before it moves to the brain. These tumors can cause the patient to suffer from a wide range of symptoms, including balance problems, memory gaps, severe headaches, vomiting, tingling in the extremities and muscle twitches. There are several different treatment options depending on the type of brain cancer that the patient is diagnosed with, including radiotherapy, surgery and chemotherapy. Each of these treatments has its own pros and cons, and the expected survival rate will be dramatically impacted by the individual’s age and tumor type. 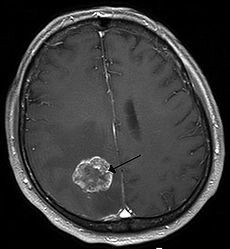 Unfortunately, even with an aggressive course of treatment, there are some types of brain cancer that only have a 12 month life expectancy. Either way, the process of receiving treatment is extremely expensive, and even the best insurance policy is not likely to cover all of it. Anyone who is suffering from brain cancer can easily turn to DonationTo.com to raise money online to help offset the cost of their treatment. The site provides enough tools to teach newcomers how to fundraise effectively, and you can set up a page without any technical skills. The Iram Leon – Rush the Gush Fund is a good example of how a successful online fundraiser works. The college fund that has been started for Leon’s daughter will greatly benefit from the fact that DonationTo.com allows users to keep 100 percent of the money that they collect, and there are also no credit card fees. By means of the focused help from all donators via a donation website like DonationTo.com it is possible to succeed in crowdfunding for medical expenses. Together with The Wall Street Journal, we support the brain cancer treatment, by offering the possibility to crowd fund.